Use this technique to understand how seasons happen on the Earth. The Earth is tilted. 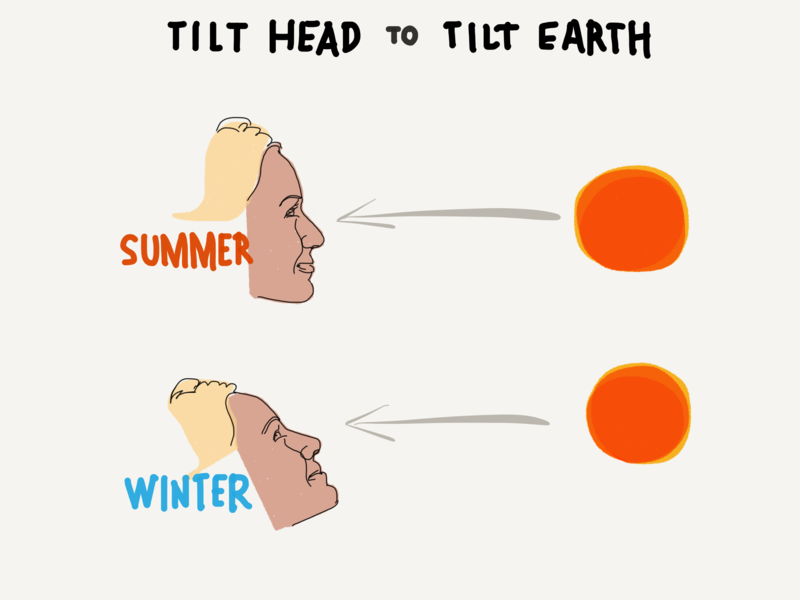 When the northern part (your forehead and eyes) tilts away from the Sun the season is winter. When the northern part tilts toward the Sun the season is summer. The Earth is tilted as it spins daily – it is not straight up and down like a top, but more like the Leaning Tower of Pisa (if the tower could spin!). As it goes through its yearly orbit, the Sun hits the northern and then the southern parts of the Earth. In this model, when the northern part (your forehead and eyes) tilts away from the Sun the season is winter. When the northern part tilts toward the Sun the season is summer. Did you like this season model? Any questions? Type in the comments to send me a message. Next PostNext Quiz – When is the best time to see Venus?